Since the iPhone came on the market augmented reality got more traction. Which makes sense, the smart phones today have good cameras and fast processors. Most of the augmented reality applications (in an earlier blog I explained that it is not really augmented what we call augmented) are for fun, cool, good looking but not with much benefits. Last week for the iPhone and iPod touch came out the word lens app. The idea is very promising. 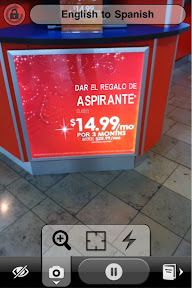 You hold your device in front of a sign and it translates the text from English to Spanish and vice versa. I had to get the app. It is a free app with in app purchase. You get two modes for free, which are just for demonstration. 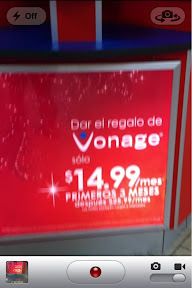 If you want to have English to Spanish you have to pay $4.99, you have to pay the same for the other way around. There are yet no other languages available, but the developers are promising that new languages will come. 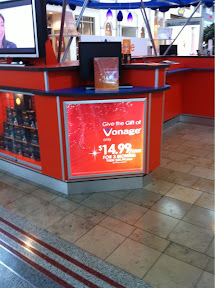 I tested the app in the mall at an ATT stand. I have to say, as long the letters are clear and big, the results are great, and it is really fun to see on live screen the text suddenly changed. However there are still a lot of drawbacks. If you are older like me and hungry, then your hand my shake a little and because of this, the app can't focus and the text changes back and for. Would be nice if they would have an image stabilizer. When you decide to take with the app a picture, the translated words are changing blue with underlined hyperlink. Which takes the whole coolness away, but i guess taking a picture and getting the hyperlinks is to find more explanation to the word. When the text is too small or the camera can't focus, like holding it close to a letter size printout, the app zooms in but has so much problem to focus that it does not make fun to use it. Trying during driving to translate a street sign is not possible at all (at least with the iPhone 4). Overall the app is some fun and shows us what, in future, will be possible, but right now it is not useful at all and the $4.99 per language is too expensive. The app got a lot press news and downloads but the ratings are poor. I hope the developers will listen to the crowd and work on some updates.